Our aluminum radiator provide up to 25%-30% more cooling over the stock radiator. 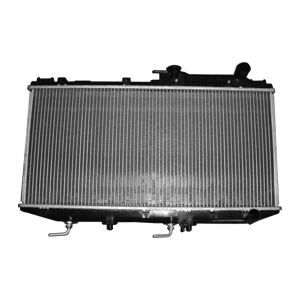 Our aluminum radiator are designed with aluminum end tanks to assist with heat dissipation. And our aluminum radiators are available with 2 or 3 even 4 row cores whereas stock radiators only contains a single row core. Also we can customize radiators according to your sample or drawing. Our aluminum radiators feature a 100% brazed aluminum core and our aluminum radiators are TIG welded, providing both superior strength and an overall clean look. There aren't many absolutes in racing. Here's a few, however, that most racers agree on: extra weight is bad; front end weight is worse; and an overheating race car is a serious problem. An aluminum racing radiator can address all three of these issues in one fell swoop. Teams at the higher levels of racing have already figured out that an aluminum racing radiator is a big benefit but there are still a lot of lower class racers who think the $200-$300 price tag is a deterrent. It's time that this thinking was turned around. Let me lay out a few reasons why an aluminum racing radiator is a good bet. Number one, it's a whole lot lighter than a junkyard radiator or any custom brass job. That weight is taken directly off the front tires as the radiator is nearly always located in front of the engine in race cars. Most custom radiators use one-inch tubes for a massive improvement in coolant flow. An aluminum radiator looks absolutely trick and is good for psych-out horsepower. In addition, it doesn't wear out the way other big ticket items such as camshafts, headers and tires do. We wanted to demonstrate how simple it is to use an aluminum radiator so we hooked up with the people .Our company has product in race cars competing at many levels of racing. From Winston Cup to Modifieds, from Legends racers to IROC cars, We have a vast amount of experience in racing applications for radiators, heat exchangers, oil coolers, rearend and transmission coolers, high output electric fans and more. We custom-builds their aluminum radiators to your specs, and which really doesn't add much time to your delivery date. Furnace brazing means there's no epoxy anywhere on your radiator. When you deal on a custom-built basis, it allows you to determine what size inlet and outlet the radiator will have and exactly where they are located; whether or not there's a drain; selection of cross flow, vertical flow, circular flow or dual pass; one through four rows, width, height and thickness dimensions, and even odd shapes. Here's the lowdown on installing an aluminum racing radiator in a Street Stock. The best way to secure an aluminum radiator is at the tanks where there is the most strength. Stay away from the middle area where the tubes and fins can't offer as much support. If that isn't a viable option, the next best thing is to cradle the radiator in a full-length crossbar and devise a hold-down on top that spreads the load. That's what we're showing in this article. Street Stocks can benefit from an aluminum racing radiator in many ways. First, the cars are heavy to start with, they've got too much front end weight and many run too hot. A call to us might help with all three of these problems. Furnace brazing requires some pretty heavy-duty (expensive) equipment so not every company uses this technique. We have an impressive array of tools and equipment on-site due to the huge OEM business they do under the name Thermal Dynamics. The bead is hand-rolled on the inlets because each radiator is custom-built. This ensures accuracy and quality. Our custom builds aluminum racing radiators so that you can get exactly what you need for your application. With all the variances between custom radiators there's no way to use a robotic welder. The human touch on a TIG welder allows for excellent results. The aluminum is spotless and even looks polished. And don't think your competitors won't notice the next time you remove your hood? We opted to use 24-pound radiator cap to contain the higher pressures associated with racing. The first part of the installation is to determine how long the lower cradle (or crossbar) needs to be to run from one over to the other . We planned to use two L-shaped pieces of metal to form the cradle. We cut two equal-length pieces. We used a torch to make clearance for the lower outlet on the radiator. Of course this area needs to be smoothed-out with a hand grinder. We tacked the two L-shaped pieces together from the bottom, that way the inside of the cradle will be smooth. A pre-fitting showed that we needed to trim the corner a bit. We finished welding after we knew the piece would fit properly. It turned out that a shop chair was just the right height to position the cradle where we needed it to get the radiator low enough in the car for hood clearance and fan positioning. With the chair as a prop, we could also move the radiator forward and back (within the constraints of the front hoop and fan location) until we were satisfied it was in the best location. We dropped the radiator into the cradle to confirm our positioning. It was fine. We also put the hood on to make sure we had enough clearance.